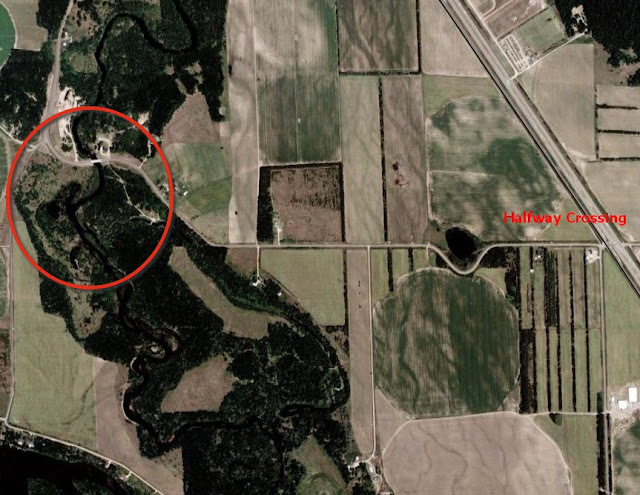 Enlarge this map and find the Karasch farm! At Aunt Fronie's funeral last week, we were discussing the "disappeared village" down by the Platte that Uncle Leo showed me. He said his father talked about it, and pointed it out to him. Perhaps but few of the present generation know that 75 years ago there was located at the present site of the bridge over Platte River, two miles south of Royalton, a thriving village of which no trace is now visible except some almost filled cellar holes and a few timbers sunk in the bottom of the river. 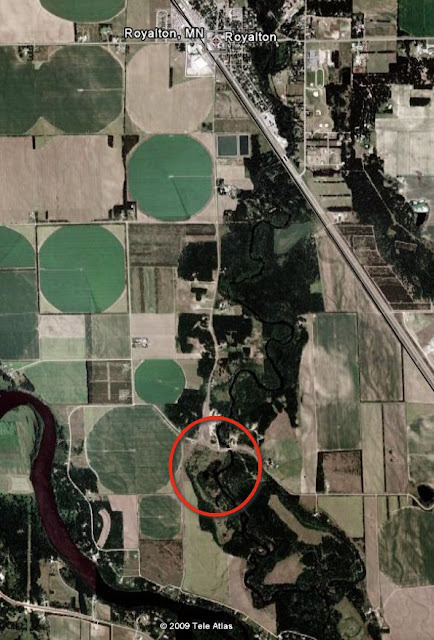 Here from 1854 to some time in the early sixties was located a town first called "Platte River," but later, "Langola." After the establishment of the place, the old stage road crossed at this point and passed through the village. 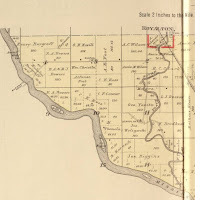 From an old plat taken from the records of Benton County we find the town was laid out into 26 blocks, each divided into lots, the location being given as Section 11, Township 38, Range 32. The names of some of the streets were Washington, Jefferson, and Jackson Avenues, Main, Oak, and Elm Streets. The water power on Platte River was improved by the erection of a dam. Flour and saw mills were erected; stores, a hotel, Indian trading post, blacksmith shop, and many residences were built, and for years it was a thriving town. After years of prosperity high water came. Platte River became a raging torrent, the dam broke, and the entire town, being built on a flat but a few feet above the river was washed away.....The town was never rebuilt, and if the curious wish to investigate the site of the "lost village" a few depressions in the earth will indicate where homes and business buildings once stood. 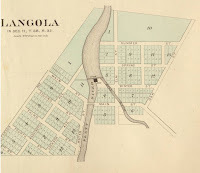 "The town of Langola is situated above the mouth of the Platte River, which is a stream of considerable importance, both on account of the extensive pineries on its upper banks, and the fertility and loveliness of the country through which it meanders after leaving those pineries. The town has but just started. It has, however, an auspicious beginning. A good grist mill is in successful operation, at which as good flour is being manufactured as can be made at any mill in Minnesota. Arrangements are being made by the proprietors of the town for the erection of a substantial saw mill which, we are authorized to say, will be ready for work during the present season. Several new houses have recently been built, one of which is now being occupied as a boarding house and hotel. 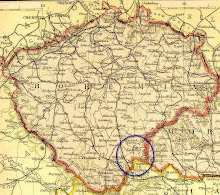 The place is surrounded by a rich farming country; is eligibly situated; possesses a valuable water power, and we see no reason why, with the energy they have thus far exhibited, the proprietory of Langola may not concentrate there considerable business and capital, and thus add one more to the long list of thriving towns in our county." (The ROYALTON page is here--can't help the awful blue background). 1903 PLAT MAP OF LANGOLA on the wonderful Minnesota Reflections site. 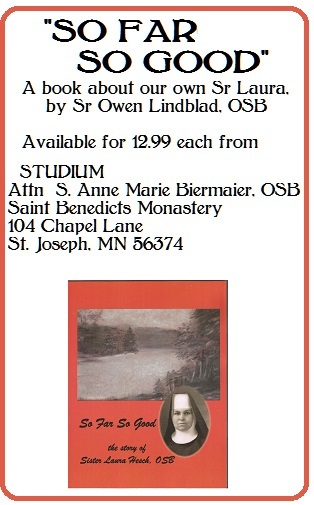 The link shows you a book of Sherburne county, but Benton is included in it. Scroll on the left. BTW, I figured out how to make pictures biggify for sure, now. YAY! Interesting additional information: Paul and Mary (Otremba) Hesch adopted a daughter named Lucy, who married Max Klein...in the 1920 Census, newlyweds Max and Lucy are listed as living with his widowed mother and his sister and brother in LANGOLA, Benton, Minnesota. Neat, huh? LOL....whenever I see a GoogleEarth map with big circles on the ground, I think about my first EVER airplane ride, to a floral school in Denver, in 1969. I had a window seat, and asked the stewardess what they were? Huge brown, gold or green circles you could plainly see from the air--and she had no idea! It took me years to realize they were irrigated crops. Duh!